MOSCOW, June 26. /TASS/. The Mi-26 (NATO reporting name: Halo) heavy-lift helicopter furnished with the Vitebsk defensive aids suite has been delivered to the State Flight Testing Center of Russia’s Defense Ministry in Akhtubinsk for trials, the Mil Helicopter Plant said in its annual report on Tuesday. 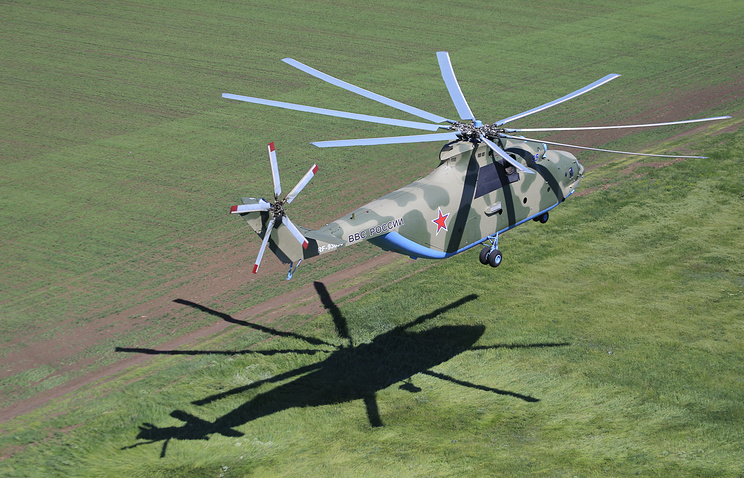 "For the purpose of raising the combat survivability of Mi-26 helicopters and considering the positive results of the defensive aids suite held earlier, and also in view of the upgrade of the Vitebsk defensive aids suite by way of replacing the gas laser with the solid-propellant version, the Defense Ministry of Russia has made a decision … on the procedure of arranging work for equipping serial-produced Mi-26 helicopters with the Vitebsk defensive aids suites," the annual report says. "In 2017, the following work was carried out: the Mi-26 helicopter furnished with the Vitebsk defensive aids suite was transferred to military unit 15650 [the State Flight Testing Center of Russia’s Defense Ministry] for control flight tests," the document says. As Russia’s Defense Ministry reported earlier, the defensive aids suite will be capable of shielding helicopters from any existing or future air defense weapons produced abroad.